The Blackberry Salad Striped Baby Blanket and Afghan continue to be some of the most popular patterns here at moogly, and I couldn’t be more pleased. Dozens of gorgeous pictures are over at Ravelry, and some of you have posted your own creations on the moogly Facebook page – love that! This one is for those of you still having a bit of trouble getting started, or getting the stitch counts just right. 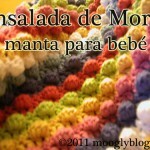 If you are still looking for details on these blankets, there is a hand drawn chart, a video on making the Bobble stitch, or dc5tog, and for the Spanish speakers, check out Ensalada de Moras! I hope this video clears up any remaining confusion! The only thing I forgot to do in this video was change colors for the stripes, but luckily I made a video for that too. If you have any remaining questions, I’ll do my best to answer them! If you do end up making one (or already have), please join us over on the moogly Facebook page and share a picture! We all love to see the finished projects – whether it’s a Blackberry Salad Striped Blanket or any other moogly pattern! Be sure to check out and like the moogly Facebook page to get the latest updates, links, sneak peeks, and more! Moogly is also on Pinterest, Twitter, and Tumblr – come join the fun! You can contact me at [email protected] or via Facebook messages. Yay! Thanks for posting these. Can’t wait to watch them. i have a question. i am at row four, and it is curling. is it supposed to? i am thinking maybe if i had used five sc instead of three, or, maybe add a border??? would appreciate your help. i could send you a pic if necessary. sorry about all lower type, having a problem with my keyboard. thank you. Lorraine, the sides are curling in? It could be any number of reasons, but I think a border should straighten it out. You might also want to try a ch 4 at the start of the dc rows, in case it’s a gauge issue. Hope that helps! Quick question. When you are dc’ing at the beginning into the chain, which loops are you hooking into? Both loops, the front loop, the back loop, or the single loop on the bottom. Couldn’t quite tell in the video. Amazing pattern, thanks for sharing! Crystal, I dc into the hump of the chain – the single loop on the bottom. It’s just easier for me that way, but not really important for the pattern, so you should just work into the chain however you prefer. 🙂 And thank you, you’re very welcome! baby, due in Nov. Has anyone a Border Pattern that would complement. 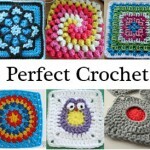 Louisa, I’ve seen single crochet, double crochet, and reverse single crochet all used to good effect! – I’m a little new at this doin just want to confirm a few things please. I know this is tedious but I am still kissing a few critical points. Row 2/dc row: then you say to double crochet into the fourth chain from hook- am I to understand this to mean that there will be THREE full chains BETWEEN where the hook is and where the hook will enter? 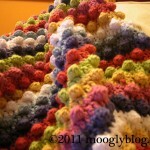 -then you say to dc into each chained stitch-according to your baby blanket example you said that would equal 113 dc. I understand that the first chains count as one of those dc therefore you went thought the motions of actually dc another 112 to get that total of 113. This also means that your total number of dc is NOW that same multiple of 4 as above + 1 extra. So in MY PATTERN- I should have 141 dc (including the initial chain 3 which counts as the first dc), correct? – does this mean that EVERY dc row from here on out should have that same number of dcs- be it 113 in your example or 141 in mine? Row 3/bobble row: next you chain one and turn- at this point you should be sc either 4 or 2 (depending on your row) but do you sc in the very first gap or stitch (the one that I think you typically would skip in a double crochet row as the chain of three would count for that stitch) or do you skip the first gap and dc 4 (or 2) after that first gap? 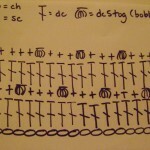 – after you initial bobble is stitched you continue the pattern of 3sc and 1 bobble til you reach the end of the row. According to the video video you should end with the same number of sc that you started with for that row (be it 2 or 4) and that you DO sc into the last stitch from the previous row (which is made up of the chain three that started your previous dc row). Should this equal 113 (or 141) stiches for this row? Row 4/dc row- now its time to chain 3 (you DO skip the first gap/stitch as I asked about earlier) and you continue to dc all the way across only this time you DON’T dc into the last rows last sc- you simple chain 1, turn and continue the pattern…Should this equal 113 (or 141) stiches for this row? This is correct. After chaining 143, you would have 140 dc plus the 3 ch sts you skipped, which counts as a dc, so 141 dc for Row 1. Yes, the loop on your hook does not count toward your chain count, so for the first Row you skip the 3 chains nearest the hook and put the first actual stitch in the next, or 4th, ch. Yes, you should have 141 total. You sc in the very first stitch – as you say the one that you’d skip for dc. A ch 1 never counts as a stitch the way a ch 3 often does. Yes, you have it exactly right! You sc into the top of the ch 3 because it counts as a stitch. When you add up the bobbles and sc sts for these rows, they should equal 141, the same as every other row of the blanket. Yes and no – chain 3, which counts as your first dc, work a dc in the next st and each st across, but then you DO work your last dc of this row into the first sc you made in the previous row. Then ch 1 and turn and continue. There should be 141 sts (including the ch 3 on dc rows but NOT the ch 1 on bobble rows) in every row of the blanket. I hope that helps! Enjoy the pattern! You are wonderful! Thank you for you patient response- sorry my spelling got goofy (cell phones and all). No problem, I’m glad it helped! Quick Question: When you are changing colors after row 2 : Do you switch on the last sc in the top of the turning chain? That is what I did and it seems to have a dip of the new color in row 2…but if I waited until after the chain– then I would have a whole DC in row 2 color.. So did I do that correctly? Hi Darin! I do change colors by finishing the last st of the previous row in the new color. It does peek a little sometimes, but seems to be the cleanest way to do it if you’re not breaking the yarn. If you are breaking the yarn after each color stripe, a great alternative is to finish off and add the new color with a Standing Double Crochet – video tutorial HERE. I am so excited to make this blanket! I watched your video on changing colors. You used two different colors, and brought up the bottom one when you changed. I thought it looked great. Does this work with 6 different colors? Just wondering if it looks weird bringing a color up 6 different rows, or if there was a better technique for lots of different colors. I haven’t ever done stripes before, thanks! Thank you Valerie! The more colors you use, the more you’ll want to think about breaking the yarn after every row and weaving in the ends. When it’s 2-3 colors, I’ll typically carry it up the sides and use an edging to cover up the “floats,” but more than that and I tend to break and weave. Otherwise it tends to get rather bulky – and the yarns get all tangled! Thanks! How would you do the join? 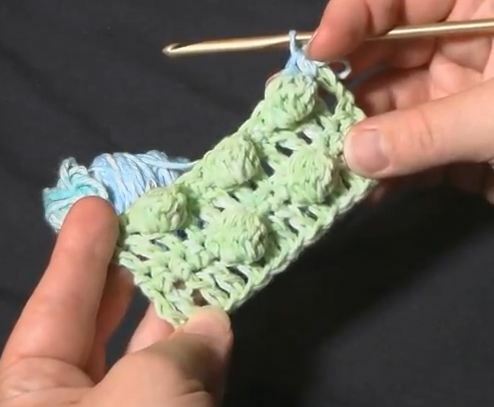 Would you use the double crochet join that you had under the changing colors video? Just wanted to say thank you for such a great pattern. This is going to be my first attempt at a blanket. I mostly stick to hats and coals but this pattern looked so fun and easy I just couldn’t resist. Thanks again. 😀 Thank you Heather! I hope you enjoy it! All my stitches and counts are coming out the way they should, but one of my ends is coming out very crooked (looks like a set of stairs) while the other end is straight. Is that something I should worry about? It does sound like you’re losing stitches somewhere. The edges *should* be straight.